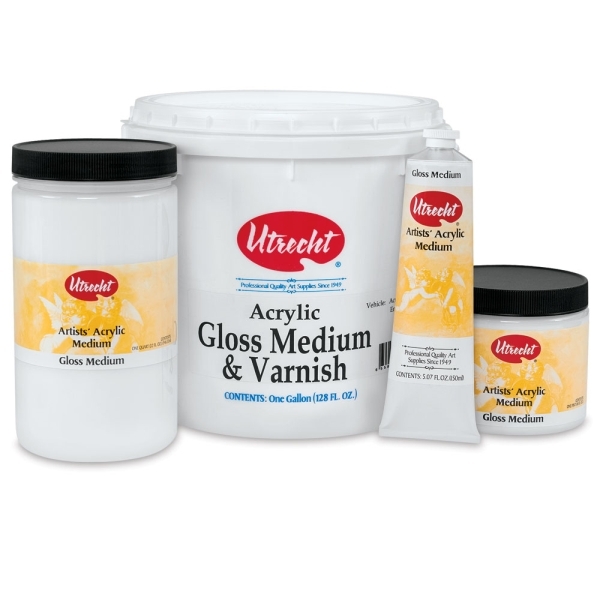 Decades ago, Utrecht developed and introduced New Temp Acrylics, one of the first artists' acrylic lines in the world. Since that time, the Brooklyn-based company has gone on to develop a broad array of innovative mediums that give the acrylic painter near limitless options for altering the luminosity, texture, workability, and sheen of their colors. 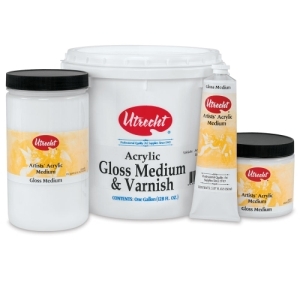 Utrecht Acrylic Mediums are fully intermixable with all brands of acrylic paint and are also an excellent value. Gloss Medium — Medium-bodied Utrecht Acrylic Gloss Medium heightens the shine, clarity, and transparency of acrylic colors. It can also be used as an adhesive, transfer medium, and protective topcoat, drying to a smooth, high-gloss finish. Try mixing Utrecht Matte and Gloss Mediums to achieve your own custom level of sheen. Matte Medium — Utrecht Acrylic Matte Medium is a medium-bodied acrylic emulsion used to tamp down the surface sheen of acrylic paints. Mixing liberal amounts with your colors will also have the effect of decreasing their transparency. Beyond painting, this medium makes an excellent collage adhesive and transfer medium. Founded more than 65 years ago in the Utrecht neighborhood of Brooklyn, New York, Utrecht is known worldwide as a leading manufacturer of top-quality, handcrafted paints and other art supplies. A groundbreaking company, Utrecht is officially recognized by the Brooklyn Made program sponsored by the Brooklyn Chamber of Commerce. This seal denotes Utrecht’s Gold Certification status and its position as a leading, locally based manufacturer and employer.